Planning an international move includes several crucial activities, and one of the most important is finding reputable international moving company. Since it requires more preparation than the average local move, your approach should be more serious, too. When contacting moving companies make sure you ask the right questions that will help you distinguish trustworthy movers from moving scams. – Is your moving company trained for international moves? Not each moving company specializes in international moves, so you need to check whether the company has enough experience in managing international moves. – How many overseas moves have they performed so far? Find out more information about their professional work and experience. – Is your international moving company willing to share the references with you? Personal recommendations of the satisfied customers can be really helpful while choosing an appropriate moving company. – Does the company offer an in-home estimate? The person who will assess your belongings should be company’s employee, not a broker. Company’s representative is more qualified to give you all answers regarding the packing and moving procedure. – Are they properly insured and licensed to perform international moves? – Is the pricing transparent? If your moving quote is based on the volume and weight if your shipment, inquire about additional moving charges and possible hidden costs. You will probably incur some extra fees like port fees, terminal charges, custom fees, delivery charges, packing and unpacking. Make sure you take them into account when creating your moving budget. – Which payment methods are accepted? If the moving company accepts cash exclusively, this should be a red flag for you signalling that you are dealing with a fraudulent moving company. It’s very dangerous to entrust your belongings to a company you didn’t check previously. – Is insurance included? Do you need to purchase an additional one in order to keep your items fully covered throughout the move or will they provide it? – Which items cannot be shipped? Transporting some items is forbidden by law, so make sure you learn about the regulations of the destination country before you sign a contract. – Does your moving company offer customs brokerage service? Your destination agent is responsible for your things at the new country and he/she should know all custom regulations and processes. Usually clearing customs includes a lot of paperwork and different fees, so you need an expert to lead you through the process. – What kind of shipping services are offered? Are they offering door-to-door or terminal-to-terminal shipping services? Will your items change 2 or more ships on their way to the new destination? – Will your items be crated? For safety purposes, have your belongings loaded in crates. Moving overseas means that your items are more exposed and at a bigger risk of being damaged. 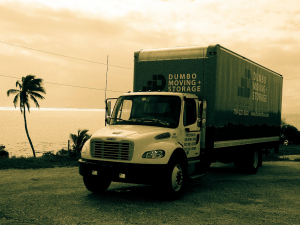 – Will your moving company do the loading as well or will they hire a third-party? If a third-party company is involved, you will want to make sure that they are trustworthy and professional just like your moving company. – Will your belongings be shipped with other people’s items? It might be a good money saving option. However, there is a possibility for your items to be misplaced or damaged if transported with other people’s belongings. – Who will receive your shipment once it reaches its new destination? A chosen destination agent will be responsible for your belongings once they arrive. Since an international move involves several parties, make sure that your belongings are in good hands by checking each service provider’s professional background. Your destination agent will also inform you about custom regulations. Asking several simple questions before signing a contract will help you find professional and trustworthy movers you can entrust your belongings.